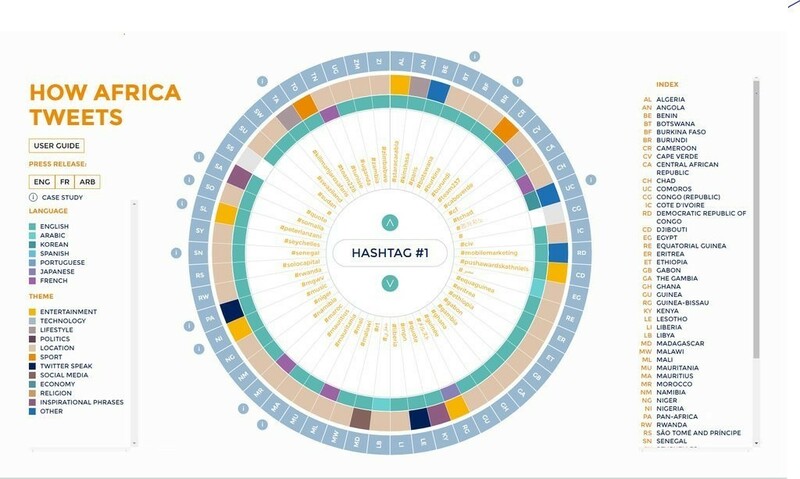 HOW Africa Tweets is perhaps one of the most intriguing reports published every year on the Twitter trends, hashtags and online habits on the continent. This year’s findings revealed that Africans are increasingly using Twitter to talk about politics, with discussions on politics accounting for 10% of tweets in this latest report, which is published by Portland Communications. That’s more than in the US and UK, where political conversations make up 1-2% of hashtags, about the same as Africa in the previous reports. Mark Flanagan, Portland’s senior partner for content and digital strategy, highlighted that in the past two reports, Twitter in Africa was “much more a space for social interaction and frivolous banter. This study, our third, demonstrates that the platform is coming of age with the prevalence of serious debate about politics and government,” he said. For example, hashtags about the Nigerian presidential elections and conflict in Burundi were among the most popular and widespread hashtags on the continent last year. There seems to be a sense that Africans have a shared destiny, and what happens in one country resonates deeply in another. 3. South Africa’s second-most popular hashtag was #FeesMustFall, the student-led movement that started in Johannesburg as a response to the perceived rising prices of higher education in South Africa. The movement rapidly spread to many other universities across South Africa, and voices from civil society also joined in. What is more intriguing is the resonance of #FeesMustFall from places very far away from the streets of Cape Town and Johannesburg. In absolute terms, Egypt actually tweeted more on #FeesMustFall than South Africa did – the data showed that in Egypt the hashtag gained 700,000 geolocated mentions, whereas in South Africa it gained about160,000. Ghana, too, generated an equal proportion of tweets on #FeesMustFall as South Africa. “This mystery is still one that puzzles us,” stated the report, as the far-reaching use of #FeesMustFall in Egypt, South Africa and Ghana is confounding, because geographically speaking these countries are on opposite sides of the continent. “Because of this, the widespread popularity of #FeesMustFall could be seen as a sign of a pan-African collective interest in social issues, highlighting unexpected and unpredictable relationship between African countries and their ability to cooperate over some of the most important social issues affecting the continent,” the report states. 4. English is by far the most dominant language on Twitter in Africa. This lingua franca has helped bridge national and cultural barriers across the continent, providing Twitter conversations with a wider reach than those using conventional media. Of the top 5,000 hashtags analysed, 77% were tweeted in English. Other top languages like Arabic and French were tweeted significantly less – only 7% and 4% respectively. In other words, even in an Arabic or French-speaking country, people tweeted in English. 5. Gabon is a French-speaking country in central-west Africa, but three of its top ten tweets had to do with events unfolding in Nigeria - #biafra, #freebiafra, and #freennamdikanu. There has been renewed separatist agitation in south-east Nigeria towards the end of last year, with calls and marches for the secession of Biafra, triggered by the arrest and detention of one prominent Biafra activist, Nnamdi Kanu. It’s interesting that this would have resonance all the way in Gabon, but there’s some history there – during the Biafran War (1967-1970), starvation was used as a tool of war; many children in Biafra were airlifted to relief camps and feeding centres in Gabon, Ivory Coast, and Sao Tome, and nourished back to health in these camps. It seems thatsome of these children were never repatriated back to their families in Nigeria, and one organisation, the US based non-profit group Igbo League has undertaken the task of identifying and, if possible, reuniting these children – who are all adults now – with their loved ones. Gabon is ground zero of finding the “ lost children of Biafra ”, so it is not altogether surprising that Twitter conversations tagged #biafra would trend there. Indeed, Gabonese president Ali Bongo has had to refute claims that he was adopted as a child from Biafra, and is not a natural-born son of former president Omar Bongo, as a controversial book by French author Pierre Péan claimed. 6. Interestingly, #BokoHaram was not among the top ten hashtags coming out of Nigeria over the past year. The terror group continued with their indiscriminate attacks on civilians, including the razing down of of the town of Baga in January that left an estimated 2,000 dead – which would make it the deadliest single attack in the group’s insurgency. More than 100 were killed in September in a series of bombings in Maiduguri, northeast Nigeria. President Muhammadu Buhari pledged to wipe out the group within three months upon assuming office, but the group’s strength endures. 8. Rwanda was the only country that had its president among the top ten hashtags on Twitter, #kagame was Rwanda’s second-most popular hashtag. It reflects the popularity of Rwandan president Paul Kagame on Twitter, and the surge in conversations following last year’s uncertainty and controversy about whether Kagame would remain in power past 2017 (he will). And while for the rest of Africa political conversations were around elections, in Rwanda, #umushyikirano2015 was among the top ten, an annual national dialogue in which government and citizens discuss development issues. 9. The most intriguing trend was that in some small countries, Japanese and Korean tweets were the most popular hashtags! In fact, the small island of Comoros had the highest level of Tweets Per Capita [TPC] of 0.77 across the continent, a surprise because it was much higher than countries like South Africa at a level of 0.29 with a population 529 times bigger. The high TPC and the prevalence of Japanese in the top hashtags was particularly strange. The mystery was solved when it was discovered that all the tweets came from an individual from Japan who had lost his job. Tweeting every five minutes he had contributed over 198,000 tweets to the world, and during the research period, 99,000 geolocated tweets had washed ashore on the Comoros. This was more tweets than Barack Obama, Narendra Modi, David Cameron, Vladimir Putin, François Hollande and even Justin Bieber combined. 10. Comoros’ “Twitter-jacking” in this fashion is not unique – in the Central African Republic, four of the top ten hashtags were Korean.